The Texans’ meeting with A.J. McCarron looks set to produce a signed contract. McCarron and the Texans are finalizing an agreement that would make him their new backup quarterback, Ian Rapoport of NFL.com tweets. McCarron agreed to a one-year deal worth $3MM, John McClain of the Houston Chronicle notes (on Twitter). Released by the Raiders last week, McCarron will land with his fourth AFC team in barely a year. But it appears the longtime backup will land on his feet, being set to work behind Deshaun Watson. 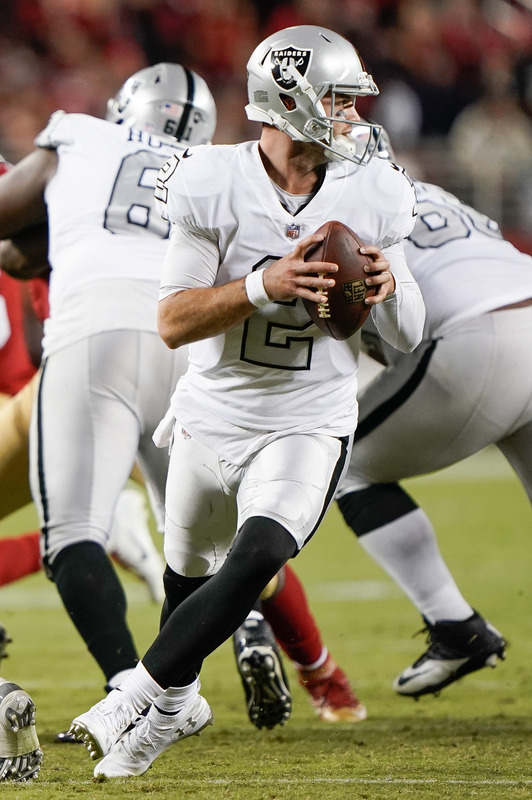 Earlier this offseason, the Raiders indicated a desire to retain McCarron as Derek Carr‘s backup. But the former Bengals, Bills (sort of) and Raiders quarterback will likely head to Houston. It has been a strange few years for McCarron. In 2015, he started a few games in Andy Dalton‘s stead and showed some promise. Then, last March, he appeared to finally be on his way toward becoming an NFL starter when he hooked on with the Bills. 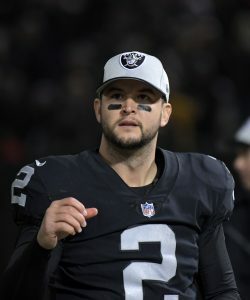 Ultimately, he did not impress in his competition alongside Nathan Peterman and Josh Allen and was shipped to the Raiders. For the bulk of 2018, he held the clipboard and watched Derek Carr go 4-12 in his 16 starts. 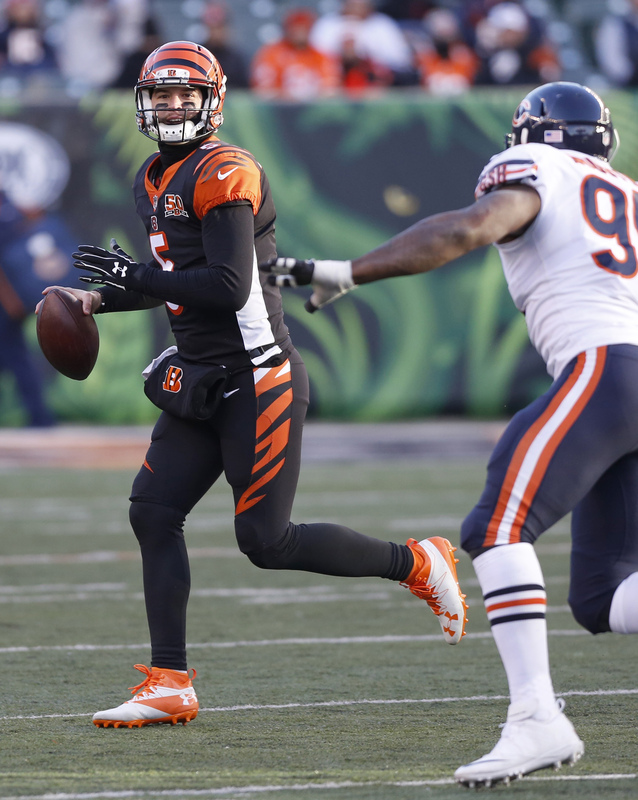 Since his work for the most recent Bengal playoff team, McCarron has attempted just 17 passes. Three came last season. The Texans still have Joe Webb on their roster, but he contributes in other facets beyond the usual backup-QB job description. Houston will not bring back Brandon Weeden, according to McClain (on Twitter). Despite Watson taking a league-high 62 sacks and having suffered a torn ACL midway through his rookie season, he played all 16 games last year and took every snap. The Texans are keeping themselves busy in the second week of free agency. On Monday, the Texans will meet with quarterback A.J. McCarron, according to Ian Rapoport of NFL.com (on Twitter). Furthermore, the Texans have some interest in former Raiders tackle Donald Penn, as Aaron Wilson of the Houston Chronicle tweets. They’ll also meet with former Bills tackle Jordan Mills on Monday, a source tells Mike Florio of PFT (Twitter link). Earlier this offseason, the Raiders said they’d be keeping McCarron in the fold for 2019. However, they had a change of heart along the way (or, they weren’t being entirely truthful about their intentions) and released the QB earlier this month. It has been a strange few years for McCarron. In 2015, he started a few games in Andy Dalton‘s stead and showed some promise. Then, last March, he appeared to finally be on his way towards becoming a bonafide NFL starter when he hooked on with the Bills. Ultimately, he did not impress in his competition alongside Nathan Peterman and Josh Allen and was shipped to the Raiders. For the bulk of 2018, he held the clipboard and watched Derek Carr go 4-12 in his 16 starts. McCarron could be a logical fit for the Texans, who may be looking for a new No. 2 behind Deshaun Watson. Last year, Brandon Weeden and Joe Webb served as Watson’s understudies, but both are free agents. Penn, meanwhile, saw his Raiders run end over the weekend. The Raiders are moving forward with high-priced pickup Trent Brown, but Penn indicated that he plans to continue playing. The Texans, who have been forced to make adjustments on the fly at tackle, could be intently interested in adding someone with Penn’s pedigree. The Raiders have released backup quarterback A.J. McCarron per Adam Schefter of ESPN.com (via Twitter). The moves comes one day before McCarron was due a $3MM roster bonus, and three days before $1.1MM of his $1.8MM 2019 salary became fully guaranteed. The roster bonus and salary guarantee proved too much to stomach, though the club could theoretically bring McCarron back on a new deal. This continues a disappointing year for McCarron, who signed with the Bills last offseason with the expectation that he would become Buffalo’s starter. 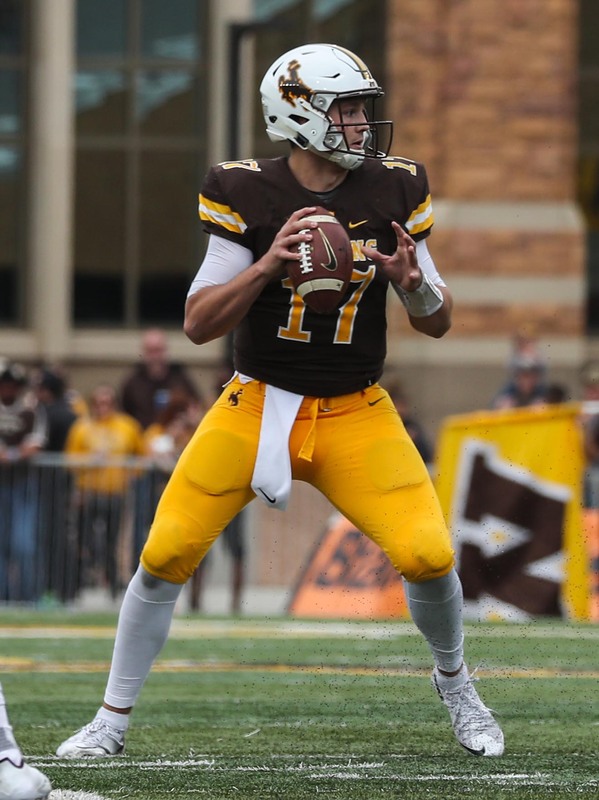 However, things changed in April when Buffalo drafted Josh Allen to be their QB of the future. Just before the start of the season, the Bills shipped McCarron to Oakland for a fifth-round pick. Raiders To Keep A.J. McCarron? Raiders quarterback A.J. McCarron is scheduled to receive a $3MM bonus if he’s on the roster on March 15. In theory, the Raiders can cut him in the next two weeks to avoid that expenditure, but it sounds like he’s still in the team’s plans for 2019. “I think Jon [Gruden] and I both believe that the backup quarterback is one snap away from playing. It’s important to have someone like McCarron ready to go,” GM Mike Mayock said (Twitter link via Michael Gehlken of the Review-Journal). In addition to his $3MM bonus on March 15, $1.1MM of McCarron’s $1.8MM salary will become fully guaranteed on March 17. McCarron, who moved between the Bengals, Bills, and Raiders last offseason, will probably be happy to take his coat off and stay a while. When signed by the Bills in March of last year, McCarron was expected to serve as the successor to Tyrod Taylor. Unfortunately for him, things changed in April when the Bills drafted Josh Allen to be their QB of the future. Just before the start of the season, the Bills shipped McCarron to Oakland for a fifth-round pick. McCarron probably still aims to be someone’s starter, but for now, he’ll be one snap away from anchoring the Raiders’ offense. The Raiders will acquire quarterback A.J. McCarron from the Bills, tweets Ian Rapoport of NFL.com. Buffalo will receive a fifth-round pick, per Adam Schefter of ESPN.com (Twitter link). The Bills signed McCarron to compete for their starting job this spring, but he quickly fell behind both Josh Allen and Nathan Peterman. Raiders coach Jon Gruden made clear that the team was in the market for a veteran backup quarterback and that they weren’t happy with the performances of returning players Connor Cook and E.J. Manuel. It’s unclear what the compensation is at this point, but it’s likely nothing more than a late round pick. The Raiders haven’t announced all their cuts yet, but this means that at least one of Cook or Manuel will be sent packing, if not both. McCarron developed a reputation as one of the league’s better backups while holding Andy Dalton’s clipboard the past few seasons. He was expected to have opportunities to start this offseason, but he was greeted with a quiet market in free agency. He didn’t draw much interest outside of Buffalo, and ended up signing a two-year deal there. The Bills will now move forward with Allen and Peterman, although they haven’t announced who will start between the two. A.J. 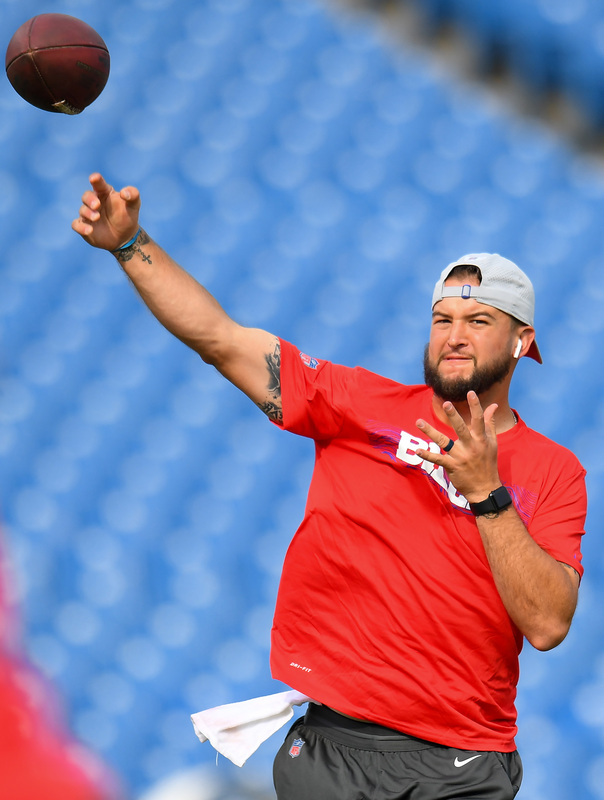 McCarron suffered an injury during his first preseason start with the Bills, and it appears likely it will affect the franchise’s quarterback plans going forward. The free agent addition suffered a hairline fracture in his collarbone, Vic Carucci of the Buffalo News reports (on Twitter). McCarron started over Nathan Peterman on Friday night in Cleveland but may have to cede the reins to the younger passer now. Peterman started the Bills’ first preseason game, but McCarron represents the bigger investment, having signed a two-year, $8.1MM deal this offseason. He was viewed as the stopgap quarterback that will provide the bridge to Josh Allen. Allen figures to see more time as a result of McCarron’s setback, and although the Wyoming product was not viewed as a ready-made NFL signal-caller, his NFL audition could come sooner than previously expected if McCarron misses extensive time. McCarron’s only relevant NFL work came because of a 2015 Andy Dalton injury, and after a trade to the Browns fell through at the last minute last year, a setback in Cleveland ten months later may deny him a chance at a surefire starting role. Peterman has one game of NFL starting experience, but that start turned out to be one of the worst in NFL history. But he may be the next man up. 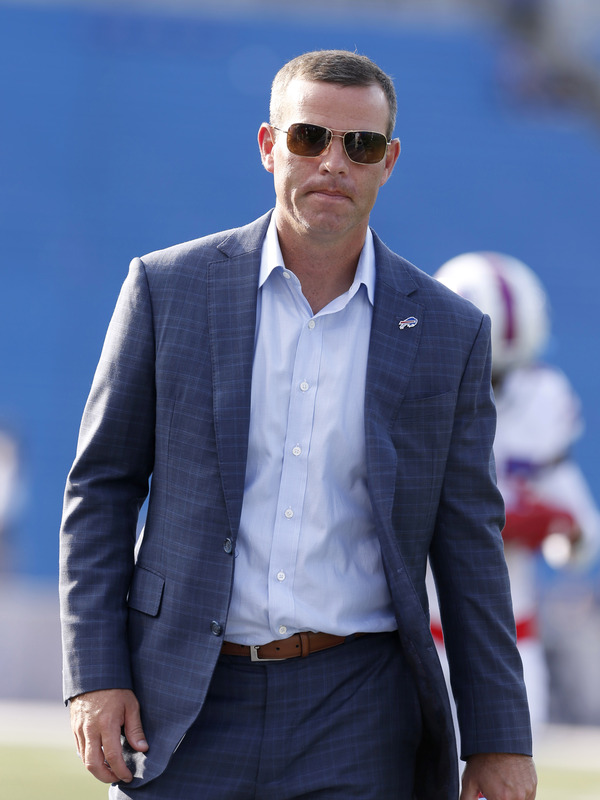 Second-year Bills GM Brandon’s Beane went through a lot to trade up and land Josh Allen, making two deals — with the Bengals and Buccaneers — to vault the Bills into that No. 7 spot. When asked about his first-round quarterback’s chances of earning earlier-than-expected playing time, Beane said it could come down to how he looks in the Bills’ first preseason game. Buffalo snapped major North American sports’ longest playoff drought last season by booking the AFC’s No. 6 seed in dramatic fashion, and that progress may impact the team’s quarterback decision. Although the Bills’ offense will look remarkably different, given that Tyrod Taylor and three key offensive linemen are out of the picture, last year’s work may prompt the GM and coaching staff to go with one of the veteran signal-callers while the Wyoming-produced prodigy observes to start the season. Beane said he will be involved in the decision, along with McDermott and new OC Brian Daboll. Ownership will not steer the team one way or another in this matter, per Beane. Daboll last served as an NFL coordinator for the 2012 Chiefs, who went 2-14, but he served as national champion Alabama’s OC last season. “It will be a group decision,” Beane said. “There’s Sean and I. We’ll obviously talk. There’s Brian Daboll. He’ll be involved. He knows more than everybody who’s hitting everything. He’s in every meeting with these quarterbacks. It’s his offense. Despite his five-interception disaster in Los Angeles last season, Peterman showed well in minicamp. McCarron would seemingly be the best bet for veteran stability, but Allen’s displayed improvement in training camp. Allen was viewed as a longer project than peers Josh Rosen or Sam Darnold coming into the draft.